Harmony Decking's Dynamite Deck Trends Predictions of 2018 - Harmony Decking - Building Decks in Bucks, Montgomery County & Beyond! As more and more people view their decks as extensions of their homes, deck designs and themes continue to evolve. Here we are with our top deck trends for 2018. Read on for inspiration! Trend #1: Are Your Floors in Distress? Composite flooring is nothing new when it comes to decks. Homeowners have learned the ease of ownership of composite decking over pressure-treated wood. So, what’s new? Grays are the cool color taking over decks. Both simple and elegant, gray can accentuate any color or design palate. Gray decks hint at stone or enduring wood in an eye-catching way. A continuing trend from last year is extending the living space. Homeowners are viewing decks as an extension of their homes and choosing comfortable furniture. Consider adding partial covering so your deck can be used all year round. Who says a deck is only meant for summer? How much do you love your new local coffee shop or brewery? Locations such as these are popular for a reason–we all find them fun and enjoyable! This is exactly why we anticipate homeowners creating funky designs in their own backyards. Your deck is the perfect platform for making your own local hotspot! There’s nothing wrong with a standard deck off the back of your home. But why limit yourself? Rooftop decks aren’t just for the city anymore. Residential homeowners can enjoy the unique setting and view from the roof as well. Also inching its way up the deck trend charts is the standalone deck. There’s no law that says we must have decks directly outside our backdoor. 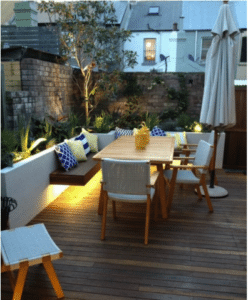 Placing a deck in the most comfortable spot in your yard based on sunlight and privacy is becoming a deciding factor for savvy homeowners. Trend #5: Light Up the Night! Feeling inspired? So are we! Whether you consider yourself trendy or traditional, Harmony Decking can help you create the perfect outdoor oasis for you. Even if you already have a deck, but you think you’re ready to upgrade, we can help. Contact the local deck experts at Harmony Decking today and let us help you design the deck of your dreams.